"That may have been one small step for Neil, but it's a heck of a big leap for me," he joked, riffing on Neil Armstrong's famous moon-landing line. Armstrong's words were in fact relayed to McCandless, who was in mission control for the moon landing in 1969. "Oh, it's beautiful, Mike. It really is," McCandless said over the radio. 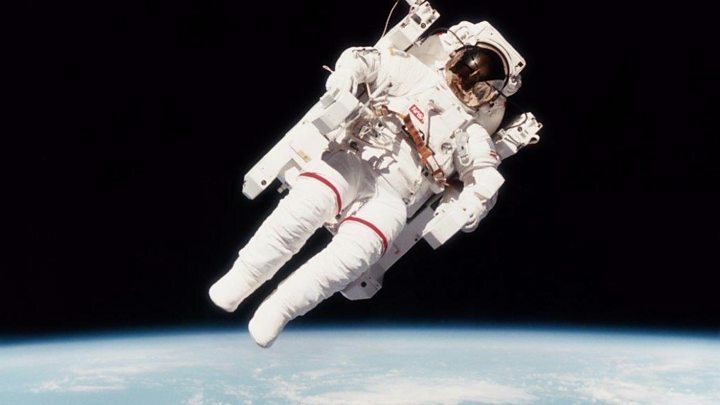 "The iconic photo of Bruce soaring effortlessly in space has inspired generations of Americans to believe that there is no limit to the human potential," said Senator John McCain, who was a classmate of McCandless at the US Naval Academy. "Once you're accustomed to seeing the Earth rushing by at four miles per second and you concentrate on the Orbiter and/or the spar as your references at hand, you feel quite comfortable flying around at the relatively slow velocities with respect to them," he said. "It's sort of like two rather fast airplanes flying formation over one another." McCandless had over the years been involved with the design and development of the jet pack that allowed him to fly alone, and over the radio from space he told mission control "we sure have a nice flying machine here". Down on earth, the New York Times described their flight in a front page article as "a spectacle of bravery and beauty". "Free from any lifeline and propelled into the dark void by tiny jets, they became, in effect, the first human satellites," the paper wrote. "It's also one of its attractions: my anonymity means people can imagine themselves doing the same thing," he wrote. "Like Neil said in 1969, I was representing mankind up there."